Space Commander™ is pleased to announce the arrival of the BikeBox™ – a revolutionary and innovative new way of storing your bikes securely and conveniently. 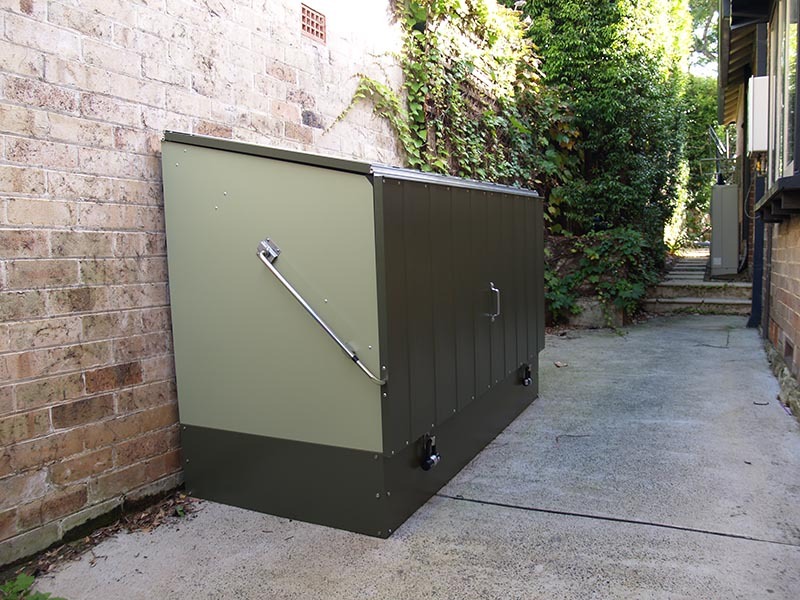 Utilising the same quality and design orientation that has underpinned the Space Commander™ range of garage storage units since 2004, the BikeBox™ provides a practical and easy to use storage space with a unique folding door. With the increasing popularity of cycling as both a recreation and alternative to automotive transport, the need for tailored bicycle storage has never been greater. The BikeBox™was developed in response to this growing need, and is suitable for installation in apartment basements, home garages, the outdoors and backyards and work places. It is constructed of robust Australian steel, and is powder-coated for long life protection, whether installed indoors or out. Attractive stainless steel trim finishes off the contemporary design appearance. The real excitement comes from the unique folding door. Gas struts make opening and closing the BikeBox™ a simple process, which then creates a large, easy to access space that can accommodate up to 4 bikes without heavy or awkward lifting. Contact us on 1300 133 963 to find out more about the BikeBox™, and arrange for an obligation free quotation.